“…they might wear classic Reeboks or knackered Converse or tracky bottoms tucked in socks…” sings Alex Turner s as I’m riding across a quarter-mile stretch of downhill forest road, both hands on the bars, concentrating hard as the studded front tyre digs into the thick sheet of ice that separates my bike from the gravel road underneath. I’ve got a normal tyre on the back wheel which means I’ve got to stay seated when the icy trail heads upwards, which isn’t as easy as it sounds given I’d decided in my wisdom to race on a singlespeed. 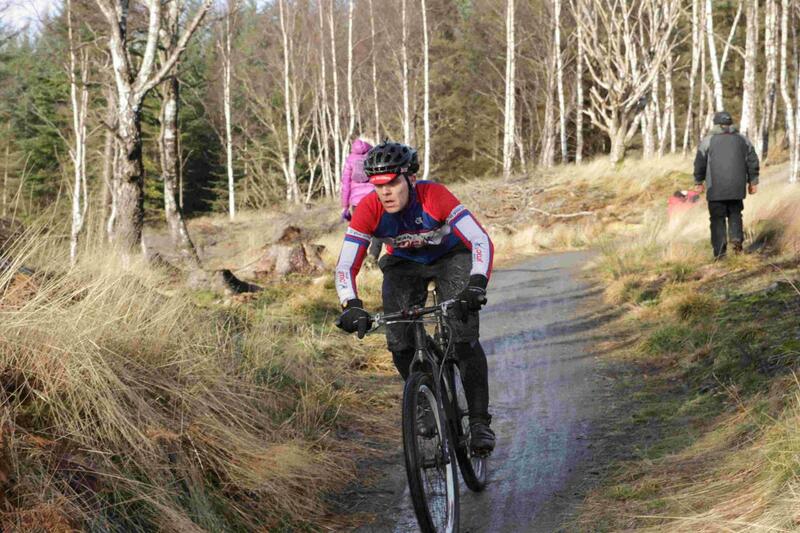 We’re around halfway through the Strathpuffer 24 hour race and I’m apparently in second place. Also, for the first time in a race, I’m racing with an MP3 player with a fairly randomly-selected playlist of top stuff which doesn’t seem to be giving me much of an advantage in the race itself but I’m probably entertaining a few marshals as I speed past while singing all out of tune….. In the previous few weeks I’d pretty much convinced myself that I stood little chance of worrying the solo podium, a lack of time and an uncharacteristically relaxed approach meant that I’d focused mainly on singlespeed-specific physical strength and my core rather than big miles and nine hour training rides. I’d learnt from last year’s Strathpuffer that trying to manhandle a one-geared bike around this course for 24 hours, while it’s not impossible (I’d finished 5th last time after all), was going to involve some hard preparation in the gym so that I’d have some long-lasting power ‘up top’ as well as in the legs. Only a handful of hours after the 10am start of the race and it went dark – as it does in the far north of Scotland in January. The course had started off slippery in places but mostly had a nice grippy layer of snow however a few hours later the weak sunshine and hundreds of tyres meant that most of the ice had gone. Those riders who had ice tyres were taking them off but I remembered the weather forecast for rain and sleet during the night and figured that this would probably cause the course to get icy again so left my (one and only) studded ice tyre on the front wheel for the duration. 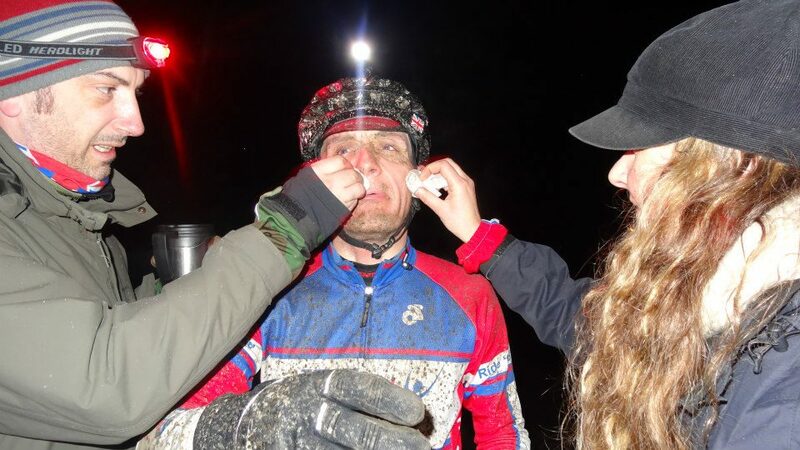 There was still some ice knocking around and I wanted to keep my few remaining teeth and sure enough, as soon as ‘proper’ night time arrived so did the drizzle and the sleet which caused large amounts of ice to form on long sections of the course. It didn’t matter to me though, my tungsten spikes were digging in while Ray Keith pummelled my inner ears with old-school jungle. By now my upper body is really starting to feel the effects of well over 14 hours of hauling on the handlebars and brute-forcing the bike up and over the steep uphill parts of the course while my wrists and hands were starting to complain about the lack of a suspension fork up front. I’m mostly having to stand when climbing, as you do on a singlespeed, however a new problem now is that a long fireroad climb near the start of the lap is so icy that I have to remain seated and try to pedal smoothly (in a gear that’s too high for that sort of thing) to maintain at least some traction from the rear wheel. All I want now is gears. But I haven’t brought any. Elsewhere in the race, Dave had had a big crash on some ice and retreated to his tent with some painkillers. A short time later, I moved into the lead. The abrasive ‘puffer mud is all over my gloves so every time I wipe my face it feels like my skin is being attacked by a belt sander. This race is tough in ways you can only discover for yourself. I don’t know for certain but my head is telling me that there are lads on geared bikes who must be catching me up. I feel like I’m starting to crawl around the course, which was probably an illusion caused by my slow cadence and the reality was that I was extending the gap to second place…. I’m doing sums in my head, as you do in the final hours of an endurance race. How many laps to I need to do? Can I be caught? If I was caught, who would be the most likely rider to catch me and would I be able to respond to an attack? Paranoia sets in. Black Sabbath pops up in my headphones. I force a Clif Turbo Shot gel down and immediately start to ride faster – the whopping dose of caffeine reigniting my senses and making me snarl a bit. Not long to go now. Stand up. Keep your back straight. The other riders behind me were busy kicking chunks out of each other while I was doing just enough to stay in the lead with my rhythmic, low-cadence grunting and grinding up the hills and grimacing down again. The ice in some sections of the course was starting to resemble a glacier and some of those riders without ice tyres looked like they were really suffering now. 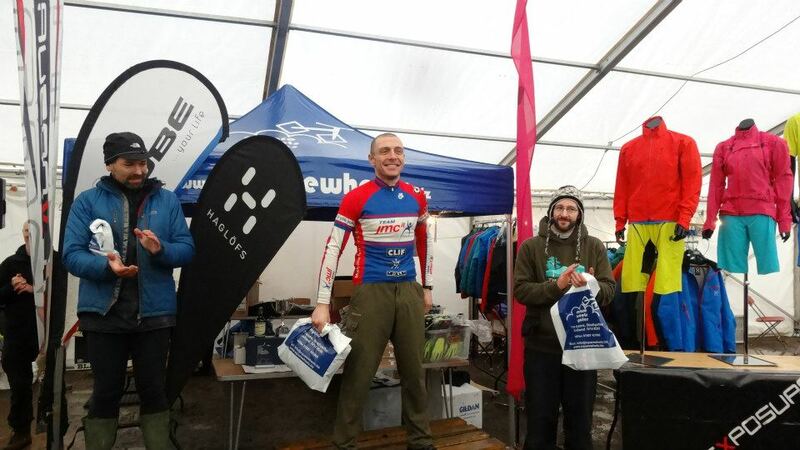 Dave was breaking hearts as he emerged from his tent, remounted his bike and immediately rode a series of very fast laps and overtook a number of riders who had previously crept in front of him and moved himself back into 3rd place. I was ready to head out to do one final lap to the sound of “Get Ready” by the Temptations, but as I entered the timing tent I was told that I’d done enough. I wasn’t entirely convinced but Debbie, waiting at the finish with a warm coat and a hug, assured me it was all over and that I couldn’t be caught. Dave maintained his position in 3rd place and elsewhere in the race, Phil and Budge had put in a storming effort to claim 3rd place in the pairs. 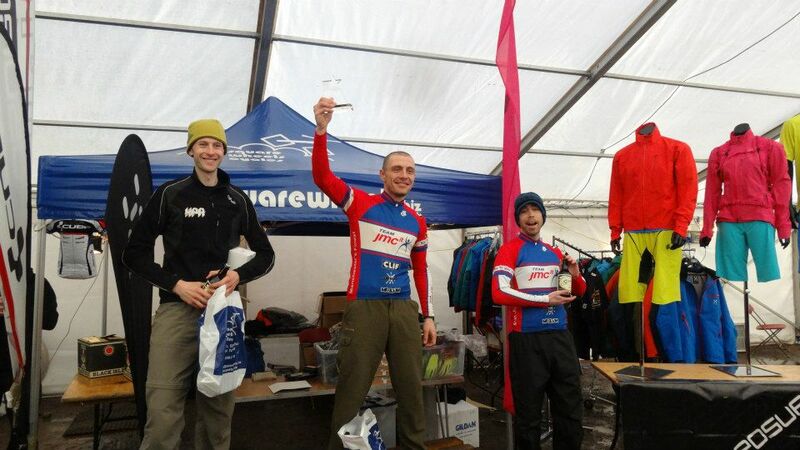 Once again every Team JMC rider had reached the podium in every category they entered. Finally, and I quite rightly say this every time, results like this are impossible to achieve without the devotion and tenacity of a solid and well-organised pit crew. Debbie, Angela and Wayne looked after all of us and our bikes throughout the entire race and catered for our every whim without hesitation. Actually getting to the race and having somewhere for pit crew to keep warm wouldn’t happen without the support and resources of Team JMC and being able to compete at this level is made possible by the amazing help I’m given by my sponsors Exposure Lights, Mount Zoom, Teko Socks, Squirt Lubes, Rolf Prima Wheels and Clif Bar. You guys all rule. As usual I’m in awe of your level of commitment and drive, never mind your fitness and skill on the bike. Massive. I’m going to take your word about how hard it was. I believe you. That’ll do for me. No need to try it. You daft, crazy, hunky-upper-bodied veteran, you. Well done Jase. Just brilliant. I big pat on the back to you Jason. Congratulations on your win. Doing what you do on the equipment you choose to use just makes me smile. I like your drive. Out of interest, how long does it take to recover after a race like that? That was a brilliant ride. Not only the record amount of laps in the ‘Puffer, but done on a rigid singlespeed – and only those who have ridden the ‘Puffer will understand what that means. Great, it has to be very very hard, I can not even immagine doin’ something like this!! I’m so glad I had suspension, gears and two ice spikes… massive congratulations… it was a tough course mentally, good to see you win!